Background– Single incision laparoscopic surgery (SILS) is the recent addition to the world of endoscopic surgery. SILS Cholecystectomy (SILS-C) has been reported to have morbidity and complications comparable to the four-port classic laparoscopic cholecystectomy (CLC), while having obvious cosmetic benefits at the same time. We report our initial experience with SILS-C in a low-cost rural setting with conventional straight instruments. Methods – 21 patients (18 women, 3 men) were prospectively enrolled in the study. All the operations were done in a rural welfare hospital in North India. The operations were carried out in a low cost set-up with basic facilities (single chip camera, non-xenon halogen light source, 0 degree-10mm scope, 10mm clip applicator) and conventional straight instruments. SILS-C was done through a transumbilical incision (2.3- 2.7 cm) and 3 ports (one 10 mm and two 5 mm) were introduced separately through the incision. The surgery was done by utilizing 1-3 retracting sutures through the abdominal wall. After dissecting cystic duct and artery, one of the 5-mm trocar was replaced with a 10-mm trocar, through which a 10-mm clip applicator was used. The post operative pain scores at 6 hrs, 24 hrs and 1 week were registered using visual analogue scores (VAS). Along with this, post operative nausea, vomiting, commencement of oral intake, hospital stay, days taken to resume normal activities, days taken to return back to professional work and satisfaction scores (scale of 1-5) were noted. The only exclusion criteria were ASA(American Society of Anesthesiology) grade>2 and failure to take a consent. Results– The mean age in SILS-C was 44.2±14.1yrs. The history of acute cholecystitis was present in 33% (7/21), jaundice in 0, pancreatitis in 5%(1/21) and ultrasonic findings of acute cholecystitis in 14%(3/21) patients. Hypertension was present in 33%(7/21) and diabetes in 5%(1/21). 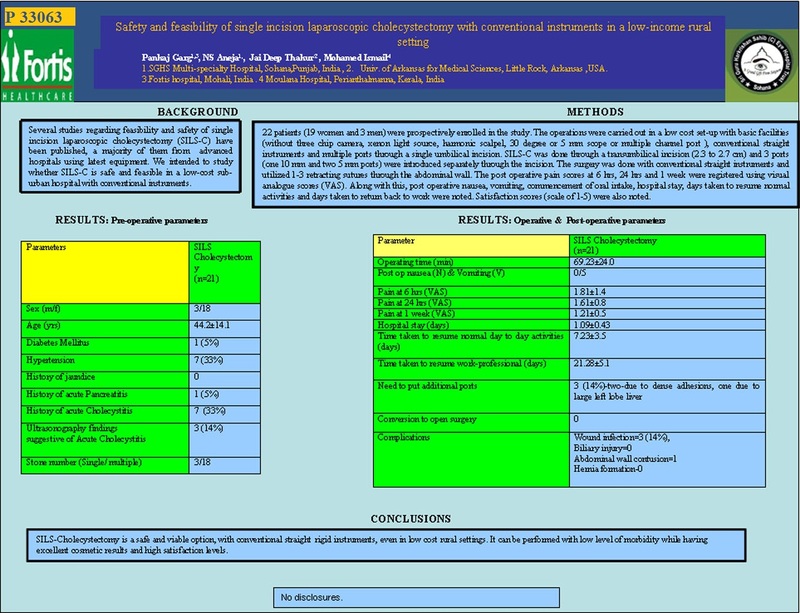 Single large stone was present in 14%(3/21) and multiple small stones in 86%(18/21) patients. The operating time was 69.23±24.0 min and average length of incision was 2.57±0.08 cms. 14%(3/21) required introduction of additional trocars(conversion)- two due to dense adhesions and one due to a large left lobe of liver leading to difficult exposure of calot’s triangle. None of the patients required conversion to open. The post operative pain scores at 6 hrs, 24 hrs and 1 week were 1.81±1.4, 1.61±0.8, 1.21±0.5 respectively. Oral intake was commenced successfully in 5.8±0.6 hrs, no patient had vomiting and 25%(5/21) experienced post operative nausea. The average days of admission were 1.09±0.43 days. The days taken to resume normal day to day activities were 7.23±3.5 days and days taken to resume professional work were 21.28±5.1 days. The satisfaction scores at one month post operation were 4.94±0.2 (out of 5). The wound infection occurred in 14%(3/21) patients causing significant morbidity (dressing >15 days). There was no major (biliary tract or bowel) complication in any of the patients. Conclusions– SILS-Cholecystectomy is a safe and viable option, even in low cost rural settings. It can be performed with low level of morbidity while having excellent cosmetic result and high satisfaction levels.